Pool is a game that can be played by anyone no matter what age or skill level. Its quick and easy to learn not to mention ridiculously fun to play! Read on to learn everything you need to know to get started playing Pool. So to begin with this beginners guide to Pool lets look at the basics of Pool. Unlike in snooker were the balls are all worth different points, Pool balls carry equal value. Pool balls can either be red and yellow or coloured stripes and solid balls. In a standard game of Pool there are 16 balls in total. These are the cue ball (white ball), the black ball (8 ball) and 7 yellows and 7 reds. If its stripes and solid balls there are 7 of each. The solid balls are numbered 1-7 and the stripes are 9-15 with the black ball numbered 8. When people start to play pool, they sometimes don’t know how to rack the balls up. This post shows you how to set a pool table properly. Once the balls are set up, the game begins with the first player breaking off which simply means taking the first shot in which you must hit a pool ball in the pack. The player that pots the first ball has to pot the rest of these type of balls. The other player then has to pot the other type. So if player one pots the first ball and its a stripe, they have to pot the rest of these balls. The other player pots the solids. Players take turns to pot their balls (solids or stripes). If they pot their ball, the player attempts to pot the next one until they miss or they pot all the balls and can try to pot the black to win the game. As mentioned above, to win the game you first have to pot all your balls and then finally the black ball. There are numerous terms used when playing Pool, some of which are obvious and some not! Here’s a explanation of the main ones. Free ball – means your opponent has fouled and left you unable to hit the ball you need to. Therefore you can hit any ball. Hustler – a really good pool player who plays badly intentionally then tricks another player into a wager and resumes the good form! Safety – When you play the white ball safe meaning to a place inconvenient for your opponent when you cant pot a ball. There are basic rules you can use to play pool or if you are a real stickler for the rules you can check the official rules for each variation of the game at the World Pool-Billiard Association. If you are a casual player and stick to these standard rules that most people play by you’ll be fine. Here’s a basic table of whats a foul in pool. The cue ball doesn't hit the ball it was supposed to. 2 shots awarded to opponent You aim for your ball but hit the black. The cue ball gets potted 2 shots awarded to opponent A Player takes their shot and the white ball goes in the pocket. Black ball is potted before you have potted all your balls Game over - you lose! You pot the black ball by accident with other balls remaining. Wrong ball is potted 2 shots awarded to opponent You pot your opponents ball. Remember, the most important rule is to enjoy the game! 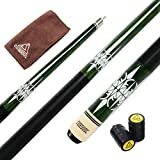 What Equipment do I need to play Pool? The only things you really need to play pool is a cue and some chalk. If you are playing in a Pool hall they will almost always supply both items when you pay to play. 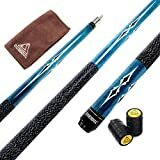 However, these cues can be really poor quality and if you are playing regularly and would like to get really good you might want to buy your own cue. Pool is a fantastic game and with a bit of practice you can get pretty good. It is a brilliant game to play with friends in a bar or Pool hall. It is a really enjoyable game and you may find yourself getting really competitive after a while! 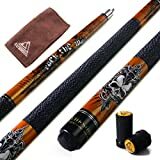 Next story Cheap Snooker Cues – Quality Snooker Cues to buy for a bargain!